As a Lector at Blessed Kateri Tekakwitha Parish in Plymouth, I was privileged to be part of the Palm Sunday Liturgy and reading of Christ’s Passion. I rehearsed so many times at home that my family could have stepped in for me if the need arose! I was focused on the readings, picturing the scene in my mind and transporting myself back to the streets of Jerusalem at the time of Christ. What would it have been like to have been a witness to the scenes described as the triumph of Palm Sunday turned to the torture and tragedy of Good Friday? Where would I have been – a follower turning away or even scarier, part of the adamant crowd following their rulers yelling for a crucifixion? In his description of Christ, I heard Deacon Jim give a perfect explanation of what it means to be a missionary – not just during Holy Week, but every day. Missionaries seek to bring the love of Christ into the hearts of our brothers and sisters around the world through their words and actions; they feed the hungry, clothe the naked, house the homeless, care for the sick and bring people assurances of God’s great love for them. Through the work of Christ’s missionaries, people know that they are not alone, no matter their circumstance. May the blessings of this Holy Week help us all to reach out in prayer and support to those doing what Pope John Paul II called “the holiest work of the Church” – being a missionary for Christ. This is the life of a priest, missionary or diocesan, in Haiti right now. Fr. Jonathon Gaspar, a priest of the Archdiocese of Boston and one of Cardinal Sean O’Malley’s Priest Secretaries, travelled last week with the Cardinal on a fact finding trip to the earthquake zone. Fr. Jonathon spoke to a local priest whose story is very similar to Fr, Tom’s: while in his home, going about his normal life, he felt the ground shake and found himself crawling out of the destruction. Now, nothing is normal. Fr. Jonathon tells a brother Priest’s story: “As a victim of the earthquake himself, he was one of the first to respond to the pressing needs of his people. He celebrates Mass for his people daily in a small garden behind where the Church and Rectory once stood. People crowd into the garden to hear the words of hope that this young priest shares from the Gospel. They celebrate the Eucharist on a makeshift Altar, constructed from slabs of concrete that were once the walls of his beautiful church. After he feeds the people with the Eucharist, the Bread of Life, he stands outside of the gate of the garden where hundreds of parishioners line up to receive food to bring home for their families. That priest is organizing the distribution of food to over four hundred families in his parish. He lives in a tent alongside his parishioners, he eats with them, he prays with them, and he cries with them. It became clearer to me that the Priest is indispensable in the life of the Church. Many people lost loved ones and everything they owned, but their priest survived, and his presence assured them of God’s presence. God is with the Haitian people, and He will continue to provide for their needs." In an effort to send immediate help to the priests of Haiti, all offerings from the Propagation of the Faith’s Easter Mass Cards will be sent to Archbishop Bernardito Auza, Papal Nuncio of Haiti; these Mass Offerings will be a lifeline to many of Haiti’s priests. 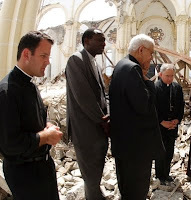 These priests in turn are a lifeline to all of Haiti’s people. For more information, call 617-542-1776 or email info@propfaithboston.org. A tip of the hat to George Martell of the Catholic Foundation for all photos. The thought came unexpectedly, as I traveled to another school to speak for the Holy Childhood Association –I knew I had come full circle. No, I wasn’t lost on Rt. 128 (again!) nor had I missed my exit. My “light bulb” moment brought me to the realization that the road on which I had been placed by the Sisters of Notre Dame at St. Michael School in Hudson was one that would lead me back to Boston to teach a new generation about praying and sacrificing for children in the missions. I had just spent a wonderful day at St. Monica School in Methuen where the Principal is Sr. Alice St. Joseph, S.N.D. Sister was a teacher and lived in Hudson when I was a student there. The Sisters who taught us were committed to helping us understand that “God is good – all the time!” It was up to us as Catholics to share that Good News with others. Every Lent, while filling my mission bank, I never dreamt that one day I would travel and meet someone who was the beneficiary of my generation’s prayers and sacrifices. In October 2006, I traveled to Esmeraldas, Ecuador to visit sites funded by the Pontifical Mission Societies. Because a large part of the area had no roads, we traveled by dugout canoe upriver for hours to a tiny village. There, we met Basilio. As a child, Basilio had been educated by missionaries in a school supported by the Holy Childhood Association. Wanting to make a difference in the faith and education of his country, Basilio went to college and became a teacher. Armed with his degree, he found a home on the River Esmeraldas, applied to HCA for seed money and built a school – with his own hands. He now has 16 students of varying ages in one classroom learning to read, to write and that Jesus loves them. The students at St. Monica’s were fascinated by the pictures and the story of this second generation success of Holy Childhood. Meanwhile, Sr. Alice St. Joseph S.N.D. is assuring that a new group of children can make it possible for Basilio’s students to pass on the lessons he teaches, just as I now pass on the lessons taught to me by the good Sisters. We’ve come full circle together through the Holy Childhood Association. As members of the Holy Childhood Association, our children are taught that the most important thing they can do for others is pray for them. 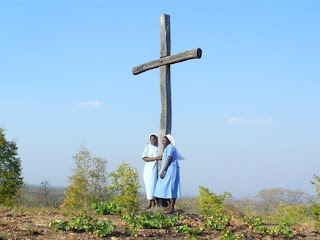 Whether it be the Hail Mary once a day, every day, that we ask of all our members, the recitation of the World Mission Rosary, focusing on a different area of the mission world with each decade or the silent offering to Jesus of an action or good deed done for others, HCA members are made aware of the need for prayer. For our members in the second grade, these prayers take on a special meaning as they prepare to receive Jesus for the first time in Holy Communion. Because the Holy Childhood Association gives our children a global view of the church, student members understand that in the 1150 mission dioceses around the world that are supported by the Holy Father’s Mission Societies, their brothers and sisters in Christ are taking the same sacramental journey. It only seemed natural to ask them to pray for each other! Participating students are given a flyer that features the picture of First Holy Communion children from Pakistan, Uganda or Zambia; the sheet also includes some information about that country – what does the flag and a map of the country look like? Who is their national patron saint? The most important part of the flyer is the prayer itself, asking Jesus to bless all children receiving Him for the first time along with all the teachers and catechists that make this possible, at home and around the world. The children at St. Jeanne D’Arc School in Lowell were thrilled to pose for a class picture, knowing that through the worldwide connections of the Pontifical Mission Societies, parent organization of the Holy Childhood Association, there will be children in the missions seeing it and praying for them. Through their participation in the program, our children are making it possible for missionaries to teach their own students about what it means to be a member of the universal Catholic family – there is ALWAYS someone ready to be your Prayer Partner, whether they live around the corner or around the world. For more information on making your First Holy Communion students Prayer Partners with a Mission, please call me at 617-779-3871 or email mheil@propfaithboston.org. With Ash Wednesday past and Lent upon us, sacrifice seems to be in order. Should we give up a favorite snack? Take time to say an extra Rosary? Volunteer at a local charity? The answer, depending on our circumstances, is yes. Our “giving up”, however, takes on a new dimension when it is done to benefit others. This Lent, consider making those “others” the missionaries and local priests of Haiti. To that end, we would like to announce the sale of our annual Easter Mass Cards and Spiritual Enrollments. Individual Mass cards can be purchased for $5 each and enrollments of a person, living or deceased in a Novena of Masses are $3. Proceeds from Mass Offerings will be sent to Archbishop Bernadito Auza, Papal Nuncio for Haiti. We will ask the Archbishop to distribute these offerings to priests throughout Haiti so that they may benefit as many people as possible. While prayerfully considering your participation in this program, think of these facts of life in Haiti received from Bishop Pierre-Andre Dumas, President of Caritas Haiti: over 180,000 are dead, over 200,000 missing; 1,500,000 people are internal refugees. In the capital of Port au Prince, 75% of homes are destroyed; other cities have lost everything as well but have not made the news. There are no more supermarkets, hospitals or government buildings. "But the Haitian people are a people who have dignity, they want to get up," said Bishop Dumas. By the grace of God, we have the opportunity to sacrifice this Lent and, through their clergy, help Haitians do just that. For more information on our Easter Mass cards and Enrollments, call 617-542-1776 or email info@propfaithboston.org.